Nope, this is NOT an April Fools’ Day prank - the Tough Travelling feature is back! Originally hosted by Nathan over at Fantasy Review Barn, the original Tough Travels ran for a whopping 83 weeks before sadly coming to an end. Well, call it a long hiatus, because Tough Travels 2.0 is back - this time as a monthly meme, hosted by Fantasy-Faction. At the start of every month, we'll lead you on a tour of the fantasy genre. From high to low, from classics to new releases, from epic to urban; each month, we will guide you in search of a different trope, theme or cliché. This month's theme is . . . In which we share examples of memorable openings from fantasy epics new and old that have stuck with us as we continue our journeys through fantasy. While there are a lot of great beginnings, there is only one iconic line that I like so much, I wear it proudly emblazoned on a menacing black hoodie. 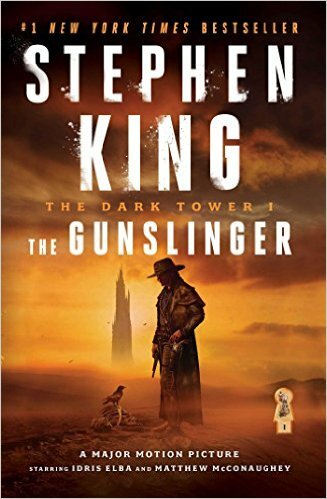 That, of course, comes from The Gunslinger, the first volume in Stephen King's epic Dark Tower saga. It's such a simple line, starkly barren of adverbs or adjectives, that reduces 4250 pages to just 12 words. Never mind context, circumstances, or back story - you are told, right from the start, that this is the story of a journey . . . a chase . . . a pursuit. Those who are disappointed in the final book seem to forget that. It's never about attaining the Dark Tower itself; it's about finding - and ending - the man in Black. "This is the tale of Elric before he was called Womanslayer, before the final collapse of Melniboné." Taken from Elric of Melnibone, the first Elric tale by Michael Moorock, it raises eyebrows as much as it does questions. Who is Elric, what does he do to earn the title Womanslayer, what is Melniboné, and what role does he play in its fall? You simply cannot read that line and not feel compelled to discover the answers, especially if this monstrous Elric fellow is to be the saga's protagonist. "Lest anyone should suppose that I am a cuckoo's child, got on the wrong side of the blanket by lusty peasant stock and sold into indenture in a shortfallen season, I may say that I am House-born and reared in the Night Court proper, for all the good it did me." 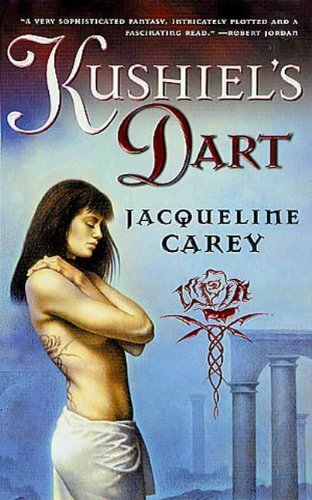 For those unfamiliar with the line, it comes from Kushiel's Dart by Jacqueline Carey. It's long, it's flowery, it's elaborate, and it's word choices are decidedly unusual for the genre. It either intrigues you or turns you off, but it says as much about the telling of the story as it does about the story to follow. "In the spaces of calm almost lost in what followed, the question of why tended to surface." Go ahead, read that over again, and try to wrap your head around it. 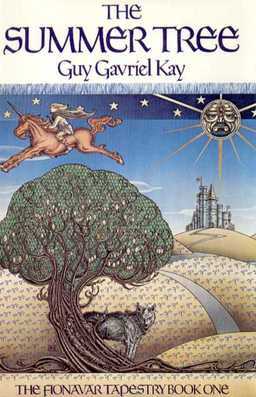 That line is taken from The Summer Tree, the opening chapter of Guy Gavriel Kay's Fionavar Tapestry. It tells you nothing about the story, the characters, or the world, but it sounds suitably epic. It speaks of time passing, hints at the chaos to come, and sort of opens your minds to the tale. Toothed beaks sunk in low green and purple vegetation, the herd of plump, brown, four-legged dinosaurs grazed placidly, oblivious to the death that kited beside sheer white cliffs high above. Dinosaurs. Yes, plump, brown, four-legged dinosaurs. 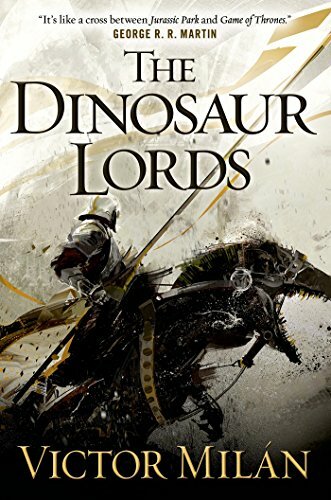 It's a gentle, placid sort of line that opens the The Dinosaur Lords by Victor Milán, but it boldly declares its concept, even as it teases the threat of violence, just beyond the borders of that line. Got a favorite line of your own? Share it below. My intro to Elric was in audio format and the Moorcock actually read the intro outloud. It was creepy, his voice was perfect, and it all had me so pysked for what followed I couldn't wait. Going for opening lines is wicked, I don't have the dedication to make sure I have them all right. Ah, opening lines! Excellent idea! Nice! Thanks for reminding me of the opening lines of Dinosaur Lords - you've reminded me how cool that was!